An illuminating double biography of philanthropist art collectors Sterling and Stephen Clark. As background to the brothers’ lives and troubled relationship, art critic Weber (Patron Saints, 1992, etc.) 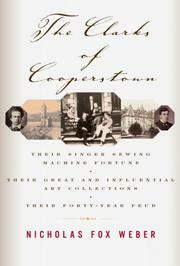 provides vivid profiles of the elders who shaped them: their shrewd, straitlaced grandfather Edward; his partner, the colorful and scandalous Isaac Singer; their talented and generous father Alfred, who had clandestine relationships with a handsome Norwegian tenor and a French sculptor; their respectable, churchgoing mother Elizabeth. Born in 1877 and ’82 respectively, Sterling and Stephen developed a deep passion for art, particularly 19th-century French painting. For a time, they went to galleries together and consulted each other about purchases, but Sterling’s 1927 lawsuit against the family over his inheritance turned them into enemies. The brothers did not speak again until the death of Stephen’s son in 1952. Nevertheless, their lives ran on parallel tracks as both continued to enthusiastically buy—and generously give away—some of the world’s greatest art. Stephen served as a deeply involved trustee of New York’s Museum of Modern Art and the Metropolitan Museum of Art; he also made major donations to Yale University. Sterling founded the Clark Art Institute in Williamstown, Mass. Besides tracking the wealthy collectors on their art-collecting expeditions, Weber includes a fascinating account of Sterling’s possible involvement in a plot to overthrow President Roosevelt and replace him with a fascist dictator, and he explores in some depth Stephen’s controversial firing of Alfred Barr as director of the Museum of Modern Art in 1943. Weber’s insights into the Clarks’ complex personalities are supplemented by his knowledgeable analyses of the art they collected, including such individual paintings as Van Gogh’s The Night Café, Cezanne’s The Card Players, Bonnard’s The Breakfast Room and Seurat’s Circus Sideshow. Genuinely rewarding and thoroughly enjoyable.